Depending on the repair your sewer needs, the cost of a sewer repair can vary greatly. 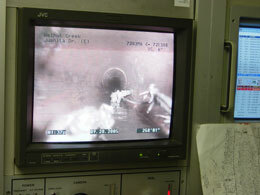 A sewer video camera or a sewer camera inspection is often used to help determine the extent of the sewer problem. Sewer repair service may not be needed if all that is required is just a cleaning out of the sewer line or drains. However, if your sewer line is cracked or if your sewer pipe collapses, a sewer cleaning service is not going to be a long term solution. When a sewer line gets crushed or collapses, mud and surrounding debris will just keep causing sewer problems. We have the experience and equipment to determine what kind of sewer repair service you need. Older clay pipes or sewer systems will crack, collapse or get infested with tree roots sooner or later. Excavating or sewer line replacement may be required to solve your sewer problems.